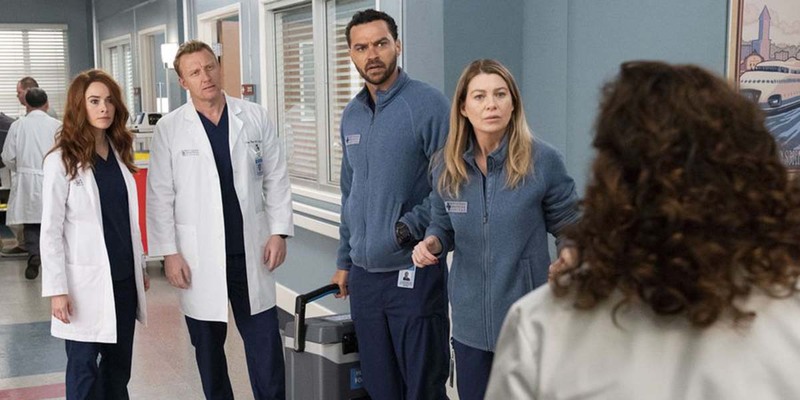 Megan Hunt makes a surprise return on Grey’s Anatomy 15×20 and Ben’s preparations to go out for Medic One causes some tensions on Station 19 2×12! Jo is still acting weird, and Alex is super worried about her. When he sees Linc later he asks him to stop in and see her. But when Linc goes to the apartment. Jo refuses to deal with him and just wants to stay in bed. Even though he brought her food, Jo continues to be in a bad mood. Linc refuses to give up though, and sticks around even when Jo keeps telling him to leave. He doesn’t even seem surprised when she pulls out vodka to start drinking. For a while they laugh and talk about old stories together, but the Jo is reminded of her parents and she gets dark again. Linc is worried about how much she’s drinking but Jo doesn’t care what he thinks. Alex rushes home when he gets a text from Linc. He’s shocked to hear that Linc doesn’t know what to do with her, he even says that this is the worst off he’s ever seen Jo. And neither of them know what is exactly wrong yet. Catherine is still getting chemo, but Jackson and Meredith have good news for her about a donor coming in for her patient. It improves her mood right away! DeLuca gets a solo surgery from Weber, and he tells Meredith he’s worried that it’s more of a test to see if he’s good enough for her rather than a medical test. He gets a little uncomfortable when the patient basically starts to hit on him right in front of Weber. But he can’t be rude because Weber tells him that he should be keeping his patient at ease. What a weird situation. When they’re in surgery, DeLuca gets confused when Weber asks where he sees things going. Automatically, he thinks Weber is talking about his relationship with Meredith so he starts to talk about it. But what Weber actually meant was his career, so DeLuca says he’s interested in general surgery. The conversation veers off course though when they realize that they need to open up the patient. When they find an anomaly Weber wants to take over but DeLuca doesn’t even give him the chance and shows that he knows what he’s doing. Even though he didn’t follow Weber’s lead, DeLuca impresses him. It looks like DeLuca has proven his ability as Weber tells him that he’ll put in a good word to the head of general surgery, which happens to be Meredith. When Weber does get the chance to talk to Meredith he tells her just how well DeLuca did in surgery, and also gives her his stamp of approval on his personality. Owen learns that Teddy is looking at houses and offers to let her stay with him, of course it’s awkward since Tom is right there. Meghan Hunt shows up and Meredith is super excited to see her, but she didn’t tell anyone else. When Meghan sees Teddy and Owen she automatically assumes that they’re together and is ecstatic. Once she finds out the truth, Meghan is furious. She starts to yell at her brother for his dumb decisions. When they’re in the middle of the argument, Tom comes in and then Meghan can’t take it anymore and leaves. Meghan’s patient is excited to meet Catherine and that also seems to help her cheer up. But Meghan isn’t so happy to learn that Owen will also be on the case with them. Meghan and Schmitt are preparing for the surgery, when Owen comes in and there’s some more arguing between the siblings. Just when they’re getting ready to go, the patient’s girlfriend shows up. But then they learn that she has no idea what’s going on and that he broke up with her months ago so he lied to Meghan about having her to take care of him after the surgery. Catherine is so upset that the patient lied that she calls of the surgery. Despite Meghan’s pleas and the fact that Jackson and Meredith show up with the donor organs. In an attempt to fix things, Owen talks to the patient and tries to talk to Catherine. It ends up working and they get ready for the surgery again. Even though they went through a little drama, the surgery still cheers Catherine up at the end of the day. But the day isn’t over for Owen and Meghan yet. Owen’s sister accuses him of letting his mental health go. The way that he bounced around from Amelia to Teddy and then back to Amelia proves that something is going on with him. I’m glad someone finally spelled out this madness to him. Meghan urges Owen to make sure that he still goes to therapy to deal with his issues. Whether he will listen or not remains to be seen! With everything that started in motion with this episode, I’m nervous what’s to come for the rest of the season. It looks like there’s a lot of drama on the horizon and I’m really not sure how this will all turn out. Especially for Jo and Alex. It looks like fans are just going to have to buckle in for the wild ride that Grey’s Anatomy season 15 is bringing us on! The episode begins with Pruitt getting frothy with Reggie, the real estate lady. It’s nice to see him doing something other than lingering around the station trying to find a new way to contribute. And you know, Reggie is right when she says they should travel and see the world. He’s spent faaaar too long being devoted to all things SFD, and he really should take some time to celebrate being free from the pressures of a career. Not gonna lie, it’s nice to see Sullivan giggle. Andy might be freaking out about walking in on her dad and his lady friend, but since it gave us chuckling Sullivan, I’m so on board with this storyline. Vic and Ripley are still fighting and there’s a moment of unbelievable tension when she’s walking out the door after being sent home by Sullivan. She’s got a really bad cold and has been sneezing on pretty much every person in the station. Vic, driving home in the rain, finishes angry shouting into Montgomery’s voicemail just in time to watch a van pop a tire and proceed to flip violently in the air— with a pregnant woman and her husband in the front seats. She assesses the husband’s condition and quickly moves on to the wife. She was in early labor when the car crashed, and that isn’t going to stop just because she’s trapped in a crumpled car. Miller’s sister shows up at the station and is delivering truth after truth to her brother about the deal he made with his mother to be fixed up on all sorts of dates. And when she’s not handing him discomfort, she’s making no secret of the fact that she things Gibson is hot. She is on a quest to find out if he’s single, and Miller is not all about that. While helping the pregnant wife and her Blueberry (the name the couple have given to the fetus until it is born), Vic tries to keep an eye on the husband by keeping in verbal contact, but he isn’t responding. She extricates herself from the wreck to go check on him, and she finds him lying unconscious on the ground in the pouring rain. Oh, and Gibson confided in Maya and she is freaking out trying to figure out how to help or not help. Montgomery gives her some food for thought when he tells her to dig deep and figure out why she cares so much. Although, he thinks she’s talking about Andy, but she is definitely thinking all kinds of Gibson thoughts. Vic checks the wife’s cervix and she’s crowning, so things are starting to get a hell of a lot more urgent very quickly. And timing is everything! Sullivan and Ripley had just finished having a heart to heart in which Ripley admitted that he and Vic are, well, he and Vic, when suddenly the station’s alarms start ringing. Vic’s call has finally been traced and they are sending Station 19 to the scene. Ripley looks down at the number that made the call and knows Vic’s number when he sees it. He is definitely not staying behind. And it stopped raining! Another victory for Vic and this couple. The wife feels like she needs to push, but Vic still hasn’t been able to free her from the wreck. She gets in place to deliver the baby as best she can. The couple are both freaking out, but Vic gives them a really wonderful story about how a yolk is safe inside the egg to calm them down and it definitely works. Anyway, just as the wife starts to push, the gasoline from their car ignites from the flare Vic threw into the road when she first approached the vehicle. The husband uses the fire extinguisher Vic had in her car to tame as much of the flames as he could, but things are looking really dire as the baby enters the world, crying loudly. A healthy baby girl is born moments before the Station 19 truck and Aid car come screaming onto the scene. Step one: put out the fire. Vic hands the newborn to Gibson to be put in the warmer as the rest of the team uses their tools to free Momma from the car. The father insists that Warren set his dislocated shoulder immediately and then gets off the gurney against Warren’s advice to go see his wife and child. Tanner arrives on scene to manage the accident and he and Andy have a little heart to heart. They are officially no longer fooling around, as he wants to try something with Jenna, his partner who he took out on a date last episode. Vic and Ripley have a sweet little moment in the Aid car where she jokingly insists she can treat herself as the adrenaline spikes one last time before she starts to fade into exhaustion. Maya and Gibson are dancing around their feelings. Maya never wanted to have feelings for Gibson. He never expected to have feelings for her. And yet, they can’t seem to deny them. So they make out on the station roof. As you do. Ripley takes Vic home and tucks her into bed, taking care of of his sick lady, but she won’t convalesce completely until they finish this fight they’re having. They both admit that they want to make this work, so they seem to be committed to keeping what they need to keep secret secret, and playing the rest by ear. Next week’s ep is all about blackouts and explosions, so I’m definitely expecting there to be an interpersonal explosion or two as well. Oh, and if Sullivan and Andy exchange any more meaningful glances across rooms, I swear I’m gonna start full on shipping them. I mean, I’m already fond of their friendship after their traumatic ordeal, but they would be really cute together.